Hey – good news. Don’t worry so much about the College Football Playoff Committee and its rankings. And whether Auburn would also have passed FSU like Oregon did. And whether Auburn should be ranked ahead of one loss teams who haven’t played anyone (Ohio State). Just let it go. We have heard from some of you “What is left to play for now that Auburn might not make the playoff?” We have strong feelings about this topic: College football was the best sport in the world before we ever had a playoff. Any season in which Auburn can beat LSU, Georgia and Bama is a GREAT season, regardless of whether we win the SEC or make the playoff or both. Don’t let the loss to Texas A&M ruin your season. Enjoy every moment of Auburn football. Clearly Auburn’s coaching staff and players are making adjustments and shutting down opponents in the second half. But why can’t they perform at a higher level earlier in the game? With Auburn’s offensive scoring ability it is understandable that teams are aggressive in their play calling against the Tigers, but our defense should expect that at this point. Do you they need a different pre-game routine? Start the game more or less aggressive in the defensive play calling? Change the starting lineup? Georgia wants revenge against Auburn for losing in Jordan-Hare last season. You may remember it. Auburn wants revenge for having to hear about how lucky it was to win a game that it was winning by 20 points at the start of the 4th quarter. Auburn was blowing Georgia out of the stadium and should have finished them. Instead the visitors roared back to score 21 fourth quarter points aided by Auburn penalties, incomplete passes that stopped the clock, an Aaron Murray touchdown that wasn’t, and the collision of two Auburn players in the backfield on a sweep. Do you want to understand more about the recent history of the Auburn – Georgia rivalry? If so read this and then this. Now you understand the rivalry a little bit better. What do we expect from the UGA game? 2) If you win the rushing battle you win this game. That has held true for the last ten years (2003-2013) and probably almost every game in the series. Auburn has an excellent chance to do that – if they can slow down Gurley and Chubb. Auburn allows 4.61 yards per carry in conference play and Georgia allows 4.44 yards per carry against SEC teams. 3) Georgia has played one ranked team – and that was Clemson in the very first game. And that was before Clemson figured out who its best quarterback was. So Auburn has played a much more difficult schedule and is used to playing these games against higher level competition. 4) If Duke Williams does not play (and he is not expected to) then someone else will have to step up and be a key 3rd down target for Nick Marshall. Auburn has plenty of options to fill this role but one of them must step up. 5) What is Georgia really good at? Winning the turnover battle. They have lost six turnovers all year. Auburn has lost six turnovers in its two defeats. 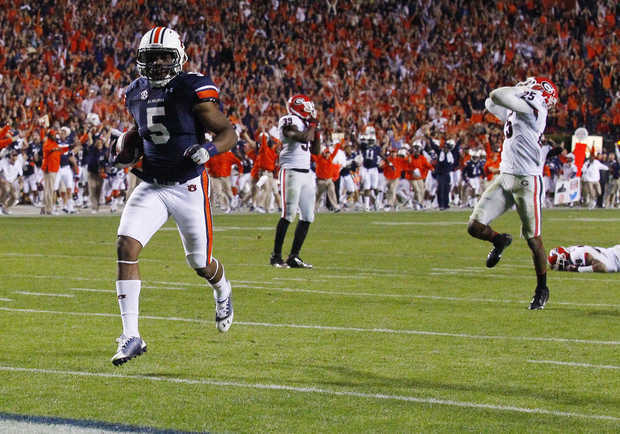 6) Georgia is better than Auburn at special teams; this is a big concern in a road game. 7) Here is the big key – Auburn cannot continue to make the number and magnitude of mistakes it made against Texas A&M or Mississippi State or South Carolina and expect to win this game. If Auburn makes fewer mistakes than it has been making (turnovers + penalties + blown coverages + missed assignments + dropped passes) then it can win this game. Auburn is the better football team. But they can’t defeat Georgia if they spot them 14 points through Auburn mistakes. Eliminate or lessen the mistakes and Auburn wins this game. You can read previous Wishbone columns (and listen to Van and John’s great podcast) here.